This is the unavoidable result of hiking the minimum wage… massive job losses. And this can’t be laid on President Trump. This is attributable to the Fight for 15! idiots. 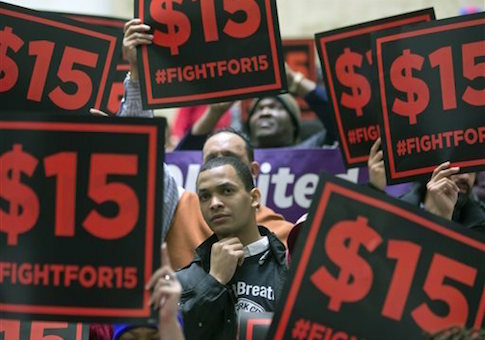 A report from the American Action Forum has come out that the minimum wage hikes will result in 1.8 million job losses. 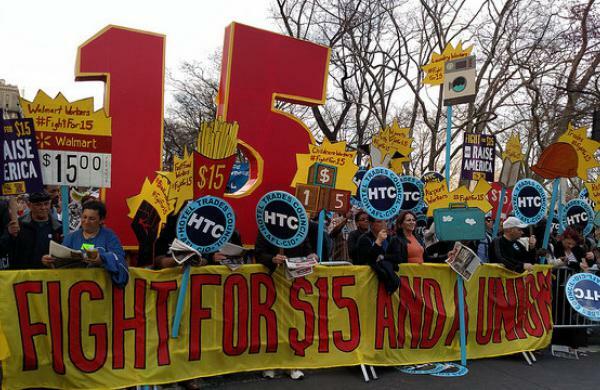 By this summer, 22 states and DC will have mandated minimum wage increases. Americans can’t afford the jump in costs and employers can’t afford the cost in wages. This is a death cycle for lower level jobs. This is why fast food outlets are automating… it’s cheaper in the long run by far. In 2017 alone, the predicted job losses will be 383,000. It’s great to raise wages if it is merited, but to mandate it rewards those who don’t deserve it and causes a huge reduction in jobs. To get a raise on $0 an hour, is to still be out of a job. Basic mathematical concepts seem to elude these morons. They are protesting themselves right out of a job. “As a result, three years later employment becomes 0.7 percent lower than it would have been absent the minimum wage increase,” the report states. Employers tend to cover the increased wages by reducing the number of employees they have. They don’t have a choice. They also raise the price of whatever they sell and they automate. “Unfortunately, it is the lowest-wage, least-skilled workers who pay the largest prices for these consequences,” the report states. “While they need those experiences most to develop skills and find better paying jobs, they are the least likely to be able to keep their jobs or find a new one when the minimum wage rises.” So, it is those that need the work the most that are adversely affected by all this. This really takes its toll on young people starting out and small businesses. These wage costs plus insurance can crush a small business and fast. They can attest to this in Arizona: “By making hiring more expensive, Proposition 206 harms young people, small businesses, and folks on the outside of the labor market trying to break in,” said Lea Marquez Peterson, who is CEO of the Hispanic Chamber of Commerce in Tucson. “As a longtime advocate for southern Arizona’s small businesses, I’ve seen firsthand the destructive effects of job-killing mandates on job creators.” So, this also hurts minorities. Way to go liberals! This is what progressive policies like this do… they hurt the very poor, those trying to get started and those trying to start a business.